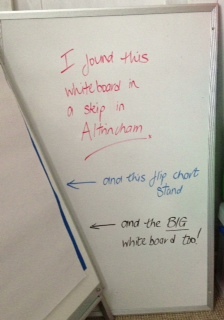 Today I had a wonderful surprise windfall: I found a whiteboard in a skip. My friend Lisa and I had just returned to the car after having been to The Victoria pub for a lovely, decadent lunch, to satisfy my chip craving. As I was about to get into the car, I spotted a skip across the road, filled with office equipment. Most of it was rubbish, but out peeked a perfectly good whiteboard! Now just last week, I had been in Staples, and had been eyeing out the whiteboards and flip chart stands, but they were so expensive. I walked away having bought only some flip chart paper. And now, here before my very eyes, was a perfectly good whiteboard being thrown away. First thoughts were: “Do you think I can just take it?” Surely someone had just thrown it away, so it was a free-for-all. That turned into: “Well surely it is better to recycle than just to throw things away”. At that point we started to walk toward the skip. Finally, as we were about to prise out the whiteboard, I noticed that there was another smaller whiteboard … and a bigger whiteboard … and a flip chart stand, and many other things we couldn’t actually get to. By this time passers by were commenting, saying: “I can see another one in the middle”, Lisa was on a stand (she is taller), urging me to “hold this back, and I can get to that one”. Not too shabby – probably worth about £100 new – all for free! They all scrubbed up perfectly well with some ordinary Ecover window cleaner. 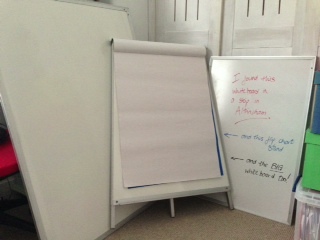 Next week’s planning for the new business is going to be so much easier now I have a whiteboard to do it on! Altrincham : A better quality of skips. Also, the chips in The Victoria are especially good, aren't they.